Prepare a gas or charcoal grill fire for indirect cooking over low (300 degree) heat. In a large bowl, mix the cornmeal, peppercorns, salt, maple syrup, oil,and bourbon. Coat the meat side of the ribs with the mixture and wrap each rack in foil. To serve, remove the ribs from the foil; scrape off the crust and reserve. Reheat the ribs meat side down over a medium-low (350 degree) direct gas or charcoal grill fire until nicely browned, 5 to 8 minutes. Flip the ribs and pat or sprinkle with about half of the reserved crust (discard the rest). Cook until hot, 3 to 4 minutes more. 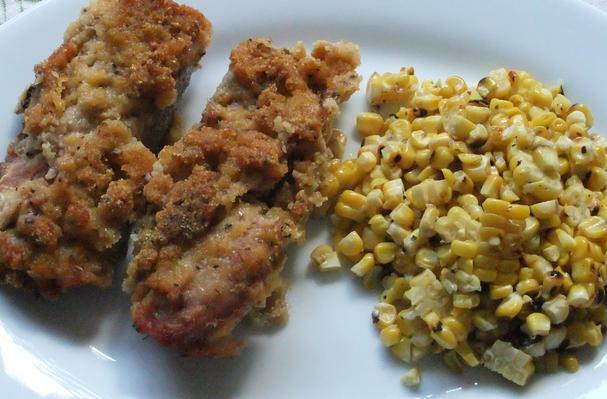 Cut between the ribs and serve sprinkled with any of the cornmeal crust that fell off while carving. I adapted this recipe somewhat to my own liking.